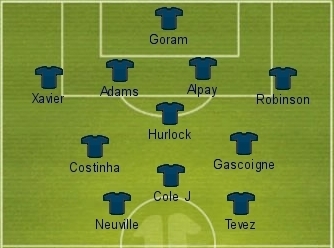 The fourth Dislikable XI arrives courtesy of the football writer, blogger and Manchester United supporter William Abbs. Having seen his contributions to The Two Unfortunates, Two Hundred Percent and In Bed with Maradona, it is a pleasure to welcome him to A United View. To read more of William's musings head over to his blog Saha From The Madding Crowd . Scottish football belonged to Rangers in the mid-90s. Such was their success that even Celtic went six years without a trophy, which, given the current Old Firm duopoly, sounds simply astonishing now. Goram was Rangers’ goalkeeper from 1991 to 1998, during which time the club equalled their neighbours’ record of nine league titles in a row. My dislike of the player, though, I should make perfectly clear, has no political motive. It’s just that he made goalkeeping look like such hard work. Capable of breaking into a sweat merely by taking a goal kick, well-proportioned Goram also put in two nervous displays for my side – *cough* Manchester United – in 2001 during the nomadic end to his career. Xavier, or Old Father Time as I liked to call him because of his white hair and fierce demeanour, arrived in the Premier League in 1999 when he joined Everton from PSV. He later moved to Liverpool, and then had two years with Middlesbrough after spells in Turkey, Germany, and Italy. To British viewers he’s probably still best known for his wild protests at conceding a penalty for handball in Portugal’s Euro 2000 semi-final against France. For his angry confrontation with referee Günter Benkö, Xavier was eventually banned from international football for six months. As a Manchester United fan with painful memories of the 1998 title run-in, when Arsenal put on the after-burners and romped to their first Premier League crown under Arsène Wenger, one of my abiding memories from that period is Adams’ goal against Everton. He scored the last in a 4-0 win that saw Arsenal wrap up the league. I’d never had much time for Adams as an England player either, reserving my admiration for United’s pairing of Steve Bruce and Gary Pallister, but that famous strike (and the Martin Tyler commentary that accompanied it) made matters personal. For a couple of years during the qualifying games for Euro 2004, England and Turkey experienced a brief but heated international rivalry. After finishing third at the World Cup in Japan & South Korea, Turkey were England’s main opponents in Group 7 and the countries played out two bad-tempered matches in Sunderland and Istanbul. Alpay was Turkey’s (and arguably one of the world’s) best defenders at the time. A very public disagreement with Aston Villa manager Graham Taylor, however, had seen him disappear from first team action during the 2002/03 season. Perhaps it’s unfair to criticise a player for enjoying a more successful career than he might have expected, but Robinson’s consistent status as a Premier League player has long baffled me. Having figured for Watford, West Brom, and now Bolton, Robinson has amassed 190 Premier League appearances spread across six seasons since 1999. He’s also been booked on 42 occasions during that time. If you’re a left back by trade, picking up a yellow card every now and then is an occupational hazard. Robinson’s tally, however, suggests that top level football, like the wide men who hurdle his tackles, is leaving players like him behind. Some players give you nightmares by virtue of a poor performance; some just give you nightmares. Terry Hurlock’s head shot in the 1994 Panini album was so harrowing that turning to Southampton’s page in order to affix another sticker was always done with much trepidation, lest one look turn you to stone. A Millwall club legend who gained three England B caps, Hurlock’s long curly hair and – how shall I put it? – difficult facial features earned him the nickname Warlock from Lions fans. True beauty comes from within, of course, and it might seem pretty rotten of me to include a player based on criteria out of his control, but the player who Neil Ruddock – never likely to have troubled the catwalks of Paris or Milan himself either – called his favourite animal takes his place in this side nonetheless. I have a problem with Gazza. Although Italia 90 is the first World Cup I can remember watching on television, I recall bits of the quarter-final against Cameroon but nothing of the epochal match against Germany that followed. Indeed, the passage of play that introduced me to Gascoigne was not the lunging challenge on Thomas Berthold but that on Gary Charles in the FA Cup final the following year. Gazza was, to my rather unsympathetic 7-year-old self, the silly man who injured himself tackling an opponent. After he moved to Italy, the infrequency with which I saw him play meant I never got past the ridiculous haircuts he sported each time he was called up to the England squad. During his renaissance at Rangers, I always felt that the quality of Scottish football undermined his success. Truthfully, I never admired Gazza as a player, even after that goal at Euro 96, because to me he always embodied colossal wasted talent. Psychological explanations for his erratic behaviour – harmful both to himself and others – continue to emerge, but the sadness of Gazza’s tale still fails to make me warm to him. The moment still haunts me now. A late Porto free-kick flies towards the top-right corner of Tim Howard’s goal. United’s keeper, now one of the finest in the Premier League but then just 25 and having a shaky first season in England, can only palm the ball down to the edge of the six-yard box. Wes Brown isn’t going to reach it; Costinha will. He scores, Porto go through, and José Mourinho embarks on the most famous sprint ever undertaken by a man wearing a fashionable raincoat. Mourinho would no doubt have had a successful career had he not benefited from a poor piece of handling by Tim Howard, but that split second set in motion an incredible sequence of events. Porto won the Champions League, Mourinho moved to Chelsea, and he (or, at least, his personality) has dominated European (not to mention English) football ever since. Is there any figure more tiresome in playground football than the hogger? You know the one: the player who’s near impossible to dispossess, and delights in proving it as he proceeds to dribble aimlessly towards the dinner hall – trailing one or two persistent opponents in his wake like some footballing Pied Piper. Eventually he trips over a stray schoolbag and loses the ball, and the game can continue. Joe Cole has always struck me as such a player, and it hasn’t surprised me in the slightest that his career has panned out the way it has. Hailed as the future of English football as a 16-year-old at West Ham, the buzz around Cole had already waned somewhat by the time he joined Chelsea in 2003. In fairness, Cole had been playing the most productive football of his career before being felled by a cruciate ligament injury in January 2009, but, although he eventually overcame that setback, a move to Liverpool last summer has only seen his fortunes suffer further. English fans hold German football (its international and club games) in such high regard that the 4-1 humiliation meted out at the World Cup drew as much praise for Löw’s team as it did criticism of England from most level-headed fans, such were our modest expectations before the game anyway. Germany’s national side has been lauded for its positive approach and youthful joie de vivre – or should that be lebensfreude? – ever since a disastrous Euro 2004 brought about a sea change in the country’s style of play, first under Jürgen Klinsmann and now Joachim Löw. Sandwiched in between Germany’s group stage exits in Portugal and at Euro 2000, however, was an improbable run to the final of the 2002 World Cup. Neuville’s 88th-minute strike against Paraguay in the round of 16 was his only goal of the tournament but it set Germany on their way to an eventual meeting with Brazil. For me, the man with the shortest neck in football sums up the mediocrity that characterised that whole tournament. Manchester United rarely let a player go when it’s not of their choosing. David Beckham and Cristiano Ronaldo could be put forward as two exceptions, but in both cases the player’s time at the club was reaching its natural conclusion anyway. Just as importantly, Beckham was welcomed as a returning hero when United played Milan a year ago and I would imagine that Ronaldo would receive the same treatment too if Real Madrid visited Old Trafford with him in the side. Tévez, though, holds the record for the player who has gone from being adored to reviled by the red half of Manchester in the shortest amount of time. Over the years, United have plucked enough of their rivals’ players away to make it difficult for me to complain too much over the Argentine’s turncoat behaviour, but it rankles with me enormously nonetheless. It’s a truth universally accepted (or it certainly should be) that European Championships make for better tournaments than World Cups. Euro 2000 boasted the finest array of talent ever assembled for a summer competition in my lifetime, the squads of France and Portugal being particularly impressive. It remains my favourite ever tournament, and some notable people (including Jonathan Wilson) are big fans of it too. It was the most attack-minded spectacle since Mexico 86. At Euro 2004, however, organisation prevailed over inspiration. Rehhagel’s Greece ground the holders (France), the tournament’s entertainers (the Czech Republic), and the hosts (Portugal) into submission to emerge as the unlikeliest of winners. Some good choices here - Hurlock was a total miscreant for Reading and I was amazed at how well he did for Millwall subsequently. It's mad to think that even with a striker of Oliver Neuville's mediocrity up front, Germany still reached a World Cup Final and Abel Xavier is a negative of Peter Sutcliffe.